Mindful Eating – what is it? I am no expert in Mindfulness as a concept. But mindfulness and eating is becoming a very hot topic and it interests me a lot. I have always been a little uncomfortable with ‘diets’ and the restriction and unrealistic eating patterns that they often result in. Then when the diet is over, the tendency is to slip back to the same way of eating as before and regaining weight. I have always been an advocate of overall change done step by step. The result is slower weight loss but a move towards healthier habits in the process – some of which offer health benefits even before any weight loss. There is a focus on the overall eating patterns and the types of foods eaten (and the nutrition they bring) rather than only on the calories or macronutrients. 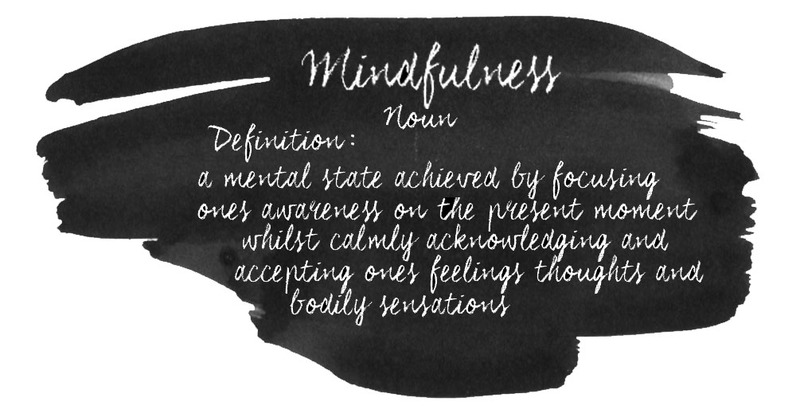 So how can mindfulness help achieve this? Why might it be helpful? You are bored or sad or …well name an emotion…..and chocolate helps!! Or rummaging in the fridge helps. Or a packet of crisps…. You eat a big slice of cake and feel guilty afterwards. You feel hungry and the food on offer is something you don’t want to eat but you eat it anyway because you are hungry. You are not that hungry but there is food on offer so you eat it. You make a cuppa and take the packet of biscuits to the living room while watching the television. And you have no idea whether you ate 2 or 5. Or you finish the packet. You serve food up the same way every evening without considering how hungry you are. Then finish everything on your plate even though you were satisfied halfway through. You need to lose weight so you go on a diet, there are restrictions on what you can eat so you want them more and more, the things you are allowed to eat become less desirable and you enjoy them less and less. You can’t wait until you reach your desired weight when you can stop controlling what you are eating. Lost weight is regained. You feel bad. You eat nothing all day because you are having a ‘blow out’ meal later at your favourite restaurant. Then eat so much you feel uncomfortable and bloated. These are all common themes around eating and they are all examples of the opposite of mindful eating. They are all examples of how we eat when we are not truly hungry, how we feel guilty for eating purely for pleasure and how we often feel hard done by when we eat things that we perceive as being ‘good’ or ‘healthy’. So how does that apply to eating? By reconnecting to our hunger and the sensations that signal hunger. Hunger is a physical sensation not a craving or mental sensation. Is your stomach feeling empty and rumbling? Do you feel lightheaded or lacking concentration? When and what did you eat last? How much do you need – try a small portion? While you are eating when do you feel satisfied? We shouldn’t just clear the plate, we should stop when the hunger is gone rather than because the food is gone or we feel stuffed full. By paying attention to your feelings – are you eating because you are truly hungry or are you feeling something that another action could sooth? Are you bored or stuck on a piece of work so you wander to the tea point or kitchen and end up eating? Are you feeling a bit down or tired? Could you go for a walk, read a bit of the paper or a book, could you talk to someone who could help, could you go and do a different task for a few minutes……? By focusing on the the food we are eating. Are you enjoying this food? Is the food on offer something that you like? Chew your food slowly, put the fork down between mouthfuls and enjoy it. Allow your body time to react to the food and give it time to say ‘I don’t need anymore’ before you have eaten more that you need. I think we all take food that is just there – the biscuits at a meeting, a slice of cake, food from a buffet – without really actively choosing. I know have eaten things and thought I don’t even like those but I have eaten so many. This awareness is important. We often eat while distracted by other things. When we eat while distracted – when we eat while watching a film or the television, while we are scrolling through social media, while we are sat at our desk working for example – it is easy to become disconnected to what our body is telling us. It is easier then to eat more than we need, eat without enjoyment, to eat without thinking. When food is available and we take food without choosing to, without ‘paying attention’ to whether we want it or like it, we are eating mindlessly. We won’t savour it, we are not making an active choice. We should choose to eat something on purpose and with reason, comfortable with that reasoning. Don’t then regret that choice or feel guilty. Our decisions should be made in the present moment. Many of our food decisions are made a while ago, we repeat the same actions because they worked for us before and so we make the same choices again even though the moment is different. It is a way for our brain to minimise all the decisions we have to make and we form habits to save head space. However, we should revisit these habits and reassess them basing them on how we feel at the moment, on new information we have and be comfortable with the decision made for the moment. There should then be no regret or guilt because the decision you made that moment was right for that moment. It doesn’t mean that faced with same decision tomorrow you will repeat it. Another aspect of mindfulness is that we should be non-judgmental. You make a decision in the moment, with awareness and acceptance. You should be comfortable with the decision. You don’t judge it. Be happy to eat for enjoyment, enjoy the fact you ordered the salad to get some more vegetables, savour the slice of brownie because you love it, be kind to yourself. Listen to your inner self saying ‘too much brownie, it is getting a bit sickly, any more will spoil the moment’, ‘I like the fruit salad on the menu’. Learn to hear yourself say ‘I don’t want that right now’ and not tell yourself ‘I can’t have that’. Learn to be kind to yourself, care for yourself. Challenge habits that you have. Stop and think – can I do this a bit better? Can I enjoy my food more? Can I eat a bigger variety of foods? Can I apply some of those old die hard nutrition messages to my day – a bit more veg, a bit more fibre, a bit more water, a bit less salt, a bit less sugar. Note – a bit more or a bit less. Not cut out this or that. Be open to trying new foods, old foods that you are sure you dislike maybe cooked a different way, be curious. Gently and positively. This is all about creating a good relationship with food and reconnecting with what your body tells you about hunger and emotion. And not confusing emotion as a cue to eat. It is not about banning foods or counting calories rather trying to improve the quality of the calories you choose. It is about being honest with yourself and gently challenging habits, making choices better by a little or a lot, by being aware of what you are eating and why. It is not about following a fad or eating style that doesn’t fit with your lifestyle however aspirational a celebrity or wellness blogger makes it look. Very often these lifestyle blogs and wellness blogs aren’t quite keeping it real! It looks amazing but is it really achievable? This is my interpretation of mindful eating. I think it can be a useful tool to help with weight management and for anyone wanting to eat better. Together with good quality, well presented, evidence based nutrition information, mindful eating could be a better way to health. A much kinder way, a much gentler and enjoyable way. Weight loss achieved by overall improved habits and a comfortable relationship with food is likely to have results that can be sustained for longer. Next Post Are diets from non experts harmful?